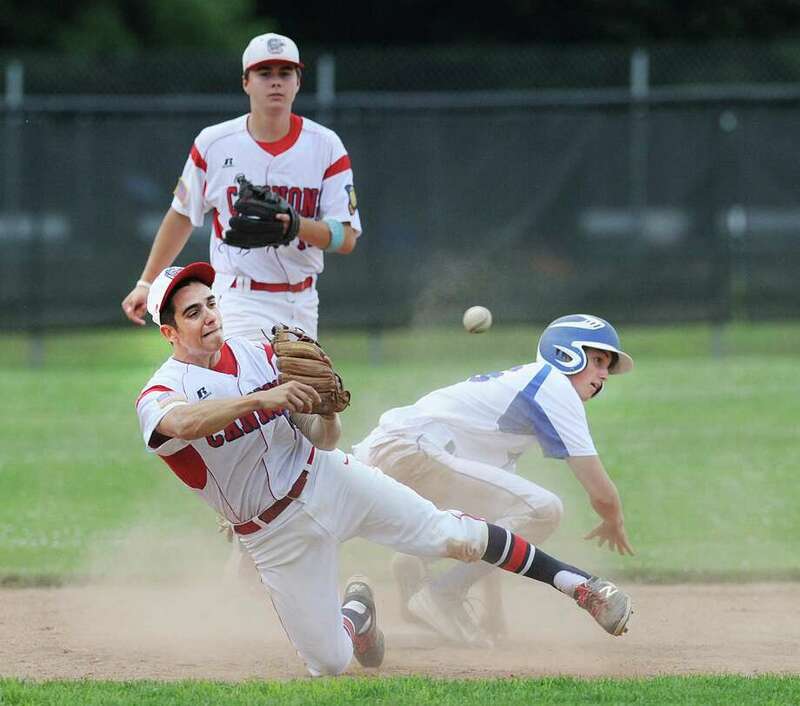 Greenwich second baseman Alex Loparco makes a throw from his knees in an attempt to get out a Darien/New Canaan runner who made it safely to first on Thursday. GREENWICH — Winning each series and claiming the Zone 4 titles were among the Greenwich Cannons’ main goals entering the season. Two thirds into the season, the Cannons are well on their way to crossing those goals off their list. The Cannons put yet another win in the books Thursday, extending their long success streak in the process. Left-hander Andrew Desino pitched five strong innings for the Cannons, who used a four-run fifth inning to register an impressive 6-2 victory over Darien/New Canaan in a Senior American Legion Zoe 4 game at Greenwich High School. With their ninth straight triumph, the Cannons upped their record to a robust 17-1. They lead Stamford in the standings by two games in the loss column. Stamford is 16-3 on the season. Greenwich took a 1-0 first-inning lead. Leadoff hitter/centerfielder Ryan King and second baseman Alex Loparco each singled, Erik Mini walked and Colin Kelly drew a bases loaded walk, making it 1-0. Desino (3-0), meanwhile, held Darien/New Canaan scoreless until the fourth inning, mixing his pitches well. Nick Walter got the start for Darien/New Canaan (12-7) and pitched three innings, yielding two runs. Loparco singled and Wil Salomon and Kelly each drew walks in the second inning, as the Cannons extended their lead on catcher Marco Pastore’s RBI groundout. The visitors closed to within 2-1 in the fourth inning, scoring their lone run off Desino. Lucian Tamburro and Kyle DeMayo each delivered doubles, cutting Greenwich’s lead in half. However, the Cannons gave themselves some breathing room with one of their signature big innings in the fifth. Mike Genaro’s pinch-hit two-run double to right center field keyed the four-run inning. Loparco also had a hit in the inning. King, Loparco and Mini have sparked the Cannons at the plate from the top three spots in the order all season. Kelly allowed one run in two innings of work to pick up the save for the red-hot Cannons.